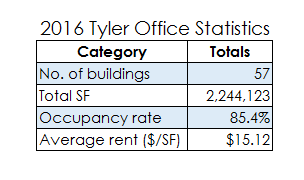 ​​​TYLER - The 2016 Tyler Office Market Survey has been released by Burns Commercial Properties, and no dramatic changes have taken place in this segment of the commercial real estate sector. The overall occupancy rate for properties surveyed came in at 85.4 percent, one half of 1 percent better than the 2015 numbers. Significantly, the average quoted rates for the properties decreased by $0.12 per sf, showing an average rate of $15.12. There is a total of 327,288 sf of space currently available in the market. The most pronounced change was found in the downtown office sector, which experienced a decline in occupancy from 80.7 percent to 78.3 percent. The average asking rate in this portion of the market is $13.05 per sf. The office market has been negatively affected by the slowdown in the energy sector plus the increased use of technology, which makes it possible to achieve the same output level with fewer employees, while allowing companies to place more workers per square foot. Additionally, more people are working from home which is also a result of technological changes. ​Click here ​to see the full Burns ​Commercial 2016 Tyler Office Market Survey (PDF).